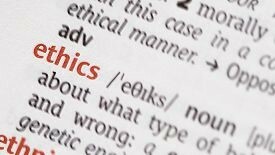 Editor’s note: This is the second in a series of articles based on the ethics issues included in the online ethics tutorial available through a link at the bottom of the General Assembly website. Situation #1. You are a legislator and an attorney. Your term as a legislator will end this year. You know that the statutory code of ethics prohibits you from lobbying, or even soliciting lobbying business, before the expiration of your term. However, you are considering accepting a position with a prestigious law firm in town with practice areas that include government and policy. There are attorneys at the firm who lobby on behalf of clients when certain policy issues come before the General Assembly. Your position with the firm, however, would not require you to lobby. May you accept a position with the law firm? Amendment 41 prohibits a legislator from personally representing another person or entity before another member of the General Assembly for two years after leaving office. The gift ban established by Amendment 41 prohibits negotiations of future employment. Since you will not personally represent another person or entity before the General Assembly and the work you will be doing will not require you to register as a professional lobbyist with the Secretary of State’s office, you may accept the position. So long as you do not offer any gifts to state officials or members of the General Assembly as prohibited by Amendment 41. The correct answer is c. Amendment 41 prohibits a former legislator from personally representing another person or entity for compensation before any other statewide elected officeholder or member of the General Assembly for two years following his or her departure from office. However, the Independent Ethics Commission (IEC) has interpreted the term “personally represent” to mean serving as a “professional lobbyist” and has concluded that a former member of the General Assembly may not accept employment that will also require his or her registration as a professional lobbyist under section 24-6-301, C.R.S. (See, IEC PS 09-02.) Because this position would not require you to register as a professional lobbyist, it is permissible to accept it. Situation #2. You are a term-limited legislator and you have been offered a paid position as a director on the board of directors of a nonprofit organization that focuses on health care issues. Although you will be a member of the board, you believe that there is an expectation, because of your former role as a legislator, that you will lobby members on certain issues important to the organization and even appear and testify before committees of the General Assembly when health care bills of interest to the organization are being considered. May you accept the position as a member of the board of directors? YES, so long as you have not solicited any lobbying business or contracts or established a lobbying business or practice before your term actually expires. YES, so long as you register in accordance with the rules of the Secretary of State. YES, because the members of the General Assembly are your friends and you will not really be lobbying them so much as chatting informally with them about topics of interest to them. NO, because Amendment 41 prohibits former members of the General Assembly from personally representing another person or entity for compensation before any other statewide elected officeholder or member of the General Assembly for two years after leaving office. The correct answer is d. The IEC has interpreted this section of the constitution as restricting a member of the General Assembly from serving as a professional lobbyist for two years after leaving office. Stated another way, the former legislator must wait two years before accepting employment that would require his or her registration as a professional lobbyist under section 24-6-301, C.R.S., or other relevant laws or statutes because of his or her new position. See, IEC PS 09-02. Want to learn more about legislative ethics? Take the Legislative Ethics Tutorial.